Jewish holidays occur throughout the calendar year, but are marked on the lunar calendar - not the solar calendar - therefore, the exact dates of the holidays change from year to year. Rosh Hashanah and Yom Kippur are two of the most important so-called "high holidays" in Judaism. They are about 10 days apart from each other and occur in early fall, in late September and early October. Rosh Hashanah marks the beginning of the Jewish New Year and begins a period of self-examination and repentance that culminates in Yom Kippur, the Day of Atonement which is marked also by repentance, prayer and fasting. This is holiest of the holidays in Judaism. Passover, or Pesach, commemorates the deliverance of the ancient Hebrews from the Egyptians as it is recorded in the Exodus narrative of the Hebrew Bible. The holiday is usually celebrates over a few days and involves the Passover meal (called the seder) of special foods that hearken back to the suffering of the Hebrew slaves in Egypt. This holiday happens in late winter or early spring. Hanukkah historically is not one of the Jewish "high holidays" but has become more prominent in recent decades because of its proximity on the calendar to the Christian holiday of Christmas. The holiday celebrates the victory of a group of Jews - called the Maccabees - over their Syrian Greek rulers. The story of the victory involves the miracle of a lamp that burned for 8 days seemingly without oil. 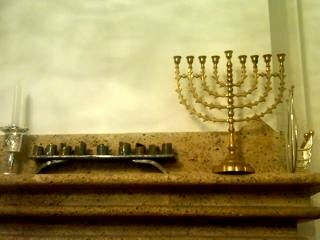 A special candlestick called a menorah (seen in the image above) symbolizes this holiday.